RIO DE JANEIRO, Brazil (CNN) -- The death toll from flooding that has covered large parts of Brazil continued to rise Friday, with the government reporting seven new fatalities, bringing the total to 38. Floodwaters reach almost to the tops of some homes in Piaui state in Brazil. 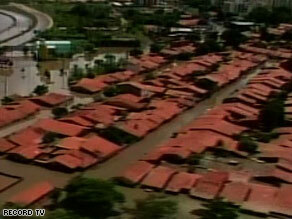 The rain-induced floods left nearly 800,000 people displaced, according to the Brazilian civil defense agency. Rain has fallen steadily in some parts of the country for more than two weeks and is forecast to continue for another 10 days. World Vision, a relief agency working in Brazil, predicted it could take 30 days for flood waters to recede. Communities in 10 states have been swamped by the floods, though most of the fatalities have occurred in the country's northeast, officials said. The Brazilian government was working with local governments Friday to deliver food, cleaning materials and other supplies to the affected areas -- using helicopters to reach some areas made impassable by flooded roads. Meteorologists and other weather specialists are divided over the cause of the downpours, particularly in the normally dry northeastern section of the nation. Some say ocean temperatures are to blame, while others say deforestation has led to the climate change. Brazil has been devastated by rain-swollen rivers for months. Flooding in the southern part of the nation in November and December killed more than 120 people and left about another 30 missing.